Decking out my Grandfather’s Battered Pre-transition Barling # 1354. In one of a first, I had decided to work on four pipes simultaneously. Well, honestly, it was a decision which was forced on me due to extraneous circumstances that I had created for me. It so happened that after having discussed with my mentor, Mr. Steve, I decided to work on a John Bessai creation from my Grandfather’s collection. As I was turning the John Bessai in my hands, I felt that there were not very many major issues involved in its restoration and the small Barling’s, also from my old man’s collection, appeared to be a straight slam dunk of a restoration. Thus, I decided to work on both simultaneously, which appeared doable. However, things turned in to a challenge when I was just surfing YouTube on pipe restoration topics. In one of the videos, Hydrogen Peroxide and water solution was used to raise the oxidation to the surface and subsequent cleaning of the same was a breeze. I decided to try out this method and in order to make max use of the solution; I dunked stems of two more pipes in to it. Now I have four pipes in line to restore. I can still manage the restorations; it is the write ups that are a huge challenge for me as Mr. Steve will vouch for the delayed submissions. Also according to Tad Gage, the only four-digit number that denotes a Pre-Transition piece begins with “1,” which was used for pipes sold in England. Any other four-digit Barling pipe is a Transitional piece– (Tad Gage in P & T magazine). Model numbers were occasionally stamped below the logo as early as the late 1920’s. The “MADE IN ENGLAND.” stamp was in use in the 1930’s thru 1962. As with all things related to Barling nomenclature there are variations. Sometimes there is no “MADE IN ENGLAND.” stamp. Examples exist with a “MADE IN LONDON” over “ENGLAND” stamp. And, there are examples with “MADE IN ENGLAND” with no period after the word “ENGLAND”. Up to 1926 and possibly beyond, Barling used specific, completely unrelated, model numbers to designate the various sizes of a specific shape. They produced pipes in three sizes, small, medium, and large. Barling’s published price lists show that they continued to offer pipes in only three sizes, small, medium, and large until 1941. That’s it, small, medium, and large. So when someone claims that they have a 1930’s EL, EXEL, or other size, they are mistaken. In 1941 the published range of sizes expanded. Going from the smallest to the largest, they are SS, S, S-M, L, EL, EXEL, and EXEXEL. There is no “G” for giant. Giant pipes, or magnums, which are oversized standard billiards, were not stamped “G” but are commonly identified by collectors as such because they are obviously large relative to even EXEXEL pipes, and carried no size stampings (Gage). Size stamps were rare before WW2, but we do an example from 1925 that we will discuss later as it is part of a forgotten class of Barling pipes. In addition to the stampings on the briar, Barling stems had stampings that relate to specific periods. In 1935 Barling received a patent for a stem design that radically improved airflow as well as cooling of the smoke. Pipes made in 1934-5 may have the words “Reg’d Design” on the underside. Not all pipes have this stamping on the underside of the stem, but its presence is a good indicator for the period of manufacture, assuming that the stem is original. Throughout their history Barling continued to innovate in the area of stem and bit design. From the above information, it is conclusively assumed that this piece is from the Family era/ Pre- transition period and was made somewhere during 1950s to 1960s. 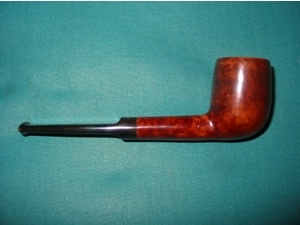 The minimalist stampings indicate that this pipe was intended to be sold in the local markets. I did not soak the stem of this pipe in the Hydrogen Peroxide solution as I was not sure how it would affect the stamping and so decided to play it safe. I flamed the stem surface of the stem with a Bic lighter to raise the tooth indentations and scratches on the stem. The heat from the flame of Bic lighter causes the vulcanite to expand and regain its natural shape, reducing the marks. The tooth bite marks which were visible after the flaming were filled with a mix of activated charcoal and clear CA superglue and I set it aside to cure overnight. I reamed the chamber with size 1 head of a PipNet reamer and followed it with a size 2 reamer head. To reach the areas where the PipNet reamer could not reach to remove the carbon cake, I used my smaller fabricated knife and scraped out all the remaining cake. I further use a folded piece of 180 grit sandpaper to sand out the last traces of remaining cake and expose the walls of the chamber to ascertain that there are no cracks/ heat fissures. I wiped the chamber with a cotton pad dipped in isopropyl alcohol to remove the carbon dust left behind by all the reaming and sanding process. The walls of the chamber were solid with no damage. I gently scraped the rim top surface with a sharp knife to remove the lava overflow. This was followed by cleaning the mortise with cue tips, pipe cleaners and shank brush dipped in isopropyl alcohol. This further eliminated traces of old smells from previous usage. The old smell was still prevalent, though greatly reduced. To completely eliminate the smell, I decided to resort to alcohol bath. I packed the chamber, just below the rim, with cotton balls. I stretched a cotton ball into a thick wick, tapering at one end, and inserted it in to the shank and pushed it as far inside as I could using a straightened paper clip. I topped the bowl with isopropyl alcohol using a syringe. I know that it is generally a practice to use Kosher salt for this procedure, but since Kosher salt is not easily available here, and when available, it’s very expensive, I use cotton balls. I find that cotton balls work just fine in drawing out all the tars and smells from the mortise and the bowl. I topped the bowl with alcohol again after 20 minutes when the alcohol level had gone down and set it aside overnight for the cotton and alcohol to do its intended job. The next day, the cotton and alcohol had fulfilled its intended task. I removed the cotton balls and ran pipe cleaners through the mortise to clean out all the loosened tars and gunk. The internals of the stummel is now clean and fresh. Now, it was the turn of the stummel to get cleaned up. Using a hard bristled tooth brush dipped in undiluted Murphy’s oil soap, I very deliberately scrubbed the surface of the stummel. I cleaned the rim too. The stummel and rim top was dried using paper napkins and soft cotton cloth. I am not very happy the way the rim top appears at this stage with all the charring and uneven inner and outer rim edges. This needs to be addressed. I set the stummel aside to dry out naturally. While the stummel was drying, I worked the stem. I covered the stampings on the stem with whitener using a whitener pen. The filling of charcoal and CA superglue had cured and using a needle file, I sand the filling to match the surface of the stem. For a better blending, I further sanded the entire stem with 220 followed by 400 and 800 grit sand paper. This helps to reduce the sanding marks left behind by the more abrasive 220 grit paper. To bring a deep shine to the vulcanite stem, I went through the complete set of micromesh pads, wet sanding with 1500 to 2400 grit pads and dry sanding with 3200 to 12000 grit pads. I wiped the stem with alcohol after each pad and rubbed it down with Extra Virgin Olive oil. The internals of the stem was cleaned out using alcohol and pipe cleaners. The finished stem is shown below. After cleaning the rim top with Murphy’s oil soap, I had observed that the rim top surface was charred and the inner edge was uneven, presenting a very sorry appearance. I topped the rim on a 220 grit sand paper, checking frequently till I was satisfied that the charred surface was greatly reduced. The inner edge is still uneven, though much better than before topping, it will need to be addressed. Next, I decided to address the dents and dings on the stummel surface and on the rim outer edge. Using a whitener pen, I marked all the major areas with dents and dings as I had decided to leave the minor ones as they were. I heated my fabricated knife over the flame of a candle, placed a wet Turkish hand towel over the marked areas and steamed out the dents by placing the heated knife over the towel. Though some dents were still observed, these were greatly reduced when compared to before steaming. The steaming method had raised to the surface all the major dents and dings. However, the outer and inner edges of the rim were still uneven. I took a piece of used and worn 180 grit sand paper, folded it and pinching it between my thumb and forefinger, created a slight inner bevel on the inner edge of the rim. Using the same technique, I created a light bevel on the outer edge. Now the rim surface and both its edges appear clean, even and well rounded. Steaming out the dents and dings from the stummel surface had necessitated that the surface of the stummel be evened out by sanding. I had an option of using more abrasive 220 grit sand paper followed by micromesh pad cycle and loose the patina or straight away go to the micromesh cycle. Using the more abrasive sand paper, minor dents and dings would be further addressed but I would lose the old sheen which the briar has taken over the years. I decided on keeping the old sheen and went straight for the micromesh cycle. The old patina and the minor dents and dings would add to the vintage look of the pipe, which it was. I wet sand the stummel with 1500 to 2400 grit pads and follow it up by dry sanding with 3200 to 12000 grit pads. I rub a small quantity of “Before and After Restoration Balm” in to briar and let it rest for a few minutes. The balm almost immediately works its magic and the briar now has a nice vibrant appearance. I further buff it with a horse hair shoe brush. To finish, I re-attach the stem with the stummel. I mounted a cotton cloth buffing wheel to the Dremel (actually it is not the brand machine, but a local machine which is similar). I set the speed at about half of the full power and applied White Diamond compound to the entire pipe. I wiped/ buffed the pipe with a soft cotton cloth to clear it of any leftover compound dust. I then mounted another cotton cloth wheel on to the polishing machine and applied several coats of carnauba wax. 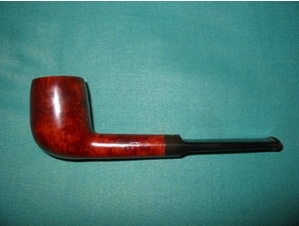 I finished the restoration by giving the entire pipe a rigorous hand buffing using a microfiber cloth to raise the shine further. The completed pipe looks lovely, fresh and vibrant; the photographs in this case, do not do justice to the appearance of this beautiful little pipe. Thank you for having the patience to reach this far while reading the write up. This entry was posted in Pipe Refurbishing Essays and tagged article by Paresh Deshpande, Barling pipes, Barling's Design, Barling's Make 1354 Saddle Billiard, Barling's Make Pre-transition # 1354, Barlings Make Pipes, Barlings Pipes, bite marks, Bowl - finishing, Bowl - refinishing, bowl topping, Bowls - refinishing, buffing, finishing, micromesh sanding pads, Oxidation, Paresh Deshpande article, pipe refurbishing, polishing, polishing a stem, polishing stems, refinishing, refurbishing, removing oxidation, removing tooth marks, repairing bite marks, repairing tooth marks, restaining, restaining a bowl and rim, sanding a stem, shaping a stem, Stem repairs, stem work, super glue, topping a bowl, vulcanite, waxing, waxing a stem on December 10, 2018 by rebornpipes. I enjoy working on Barlings pipes. They are generally carved from great pieces of briar and clean up nicely. They are light weight pipes with one of the most comfortable bits ever made IMHO. 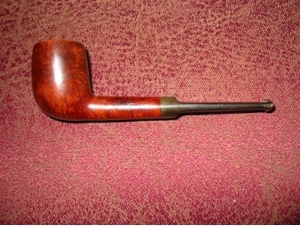 I had picked up this little Barlings Make 1364 Billiard. I have no idea on this one’s age as I have not bothered to look it up yet. It is stamped Barlings in an arch over Make inside the arch and then 1364 below that. The other side is stamped with an L. It has the Barlings thin bit saddle stem bearing the Barlings cross on the top and nothing on the underside. This one came with an over reamed bowl leaving the bowl walls thin and the bowl out of round. The left side was considerably thicker than the other sides. We are not talking a huge difference but visually it was off. The thin sides are probably a 1/8 inch thick and the left side was about a 1/4 inch thick. I carefully rounded the bowl with a knife to bring the 1/4 inch side into sync with the remainder of the bowl. The result is a much more balanced look to the bowl. Then I sanded the bowl carefully so as not to affect the finish on the top of the bowl and then buffed and polished the whole pipe. I am happy with the results and with some careful smoking this one should be able to build a good cake and last a long time. In terms of the stem I wanted to preserve the Barling cross stamped on the top and the profile. It was not in too bad shape as can be seen from the photos though it was oxidized. The oxidation I worked on by soaking it in Oxyclean to soften it. I find that though it does not remove the oxidation it makes it easier to deal with. I then carefully sanded the stem with micromesh pads. I worked with the 1500 grit pad to sand around the cross and not lose it. I also worked over the surface of the entire stem with the 1500 grit. Then I worked through the rest of the pads from 1500 to 6000 to give the pipe stem a polish. The only thing left to do was to give the pipe a good buff with White Diamond and carnauba wax to finish it up. 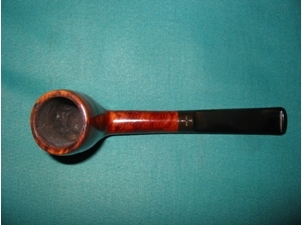 This entry was posted in Examples of Refurbished Pipes, Pipe Refurbishing Essays and tagged Barling pipes, Barlings Make Pipes, Bowls - refinishing, refurbishing, removing oxidation on a stem, repairing an out of round bowl, staining, touching up rims and bowls on July 21, 2012 by rebornpipes.